A modern translation for today's reader. As our top selling Bible version, the New International Version Bible comes in a variety of styles. They can be purchased as single copies or by the case. Available in a variety of cover types and designs, many of these generously priced Bibles have large print or are leather bound perfect for a long lifetime of enjoyment. We also have affordable Large and Giant Print, Witness Edition, Worship Edition, Military and "Take Anywhere" Soft cover Bibles. This Bible version was first released in 1978. Since then, over 200 million copies have been sold around the world. It is primarily a Protestant Bible and is particularly favored by American Evangelicals. It received a partial update in 1984 and a completely revisited update in 2011. All of the products on this page are the latest 2011 version. This large print NIV New Testament is an ideal resource for elderly outreach or even for kids learning to read. Feature rich, it is an affordable evangelical tool. A larger print NIV edition is good for those with visual problems or for new readers. These paperback editions are meant to be used as evangelical resources and are priced right. Contemporary design and affordable materials make these NIV New Testament editions an ideal choice for outreach. Purchase single copies or enjoy savings buying in bulk. Made for study, outreach, or evangelism these NIV New Testament editions are rich with features and yet affordably printed in paperback. Purchase single copies or in bulk. A well-made, large print NIV New Testament is available! This paperback edition is ideal for outreach and can be enjoyed by youngsters learning to read or elderly with visual troubles. A feature-rich outreach text, this paperback NIV New Testament is well designed and yet priced specifically for giving away. Available in single copies or in case quantities. There are too many to results display them all here. 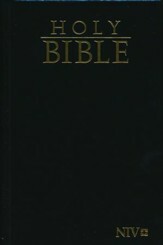 See the complete line of New International Bibles at Church Source.